Three farmers were attacked by a settler outside the village of Qaryut Wednesday, October 15th as they collected their olives for the yearly harvest. A struggle followed and the farmers managed to detain the settler until the military arrived. The settler was subsequently released without charge. At around midday, while the Palestinian farmers worked their lands close to the illegal settlement of Eli, a lone Israeli settler approached the three carrying a large stick and began threatening the farmers. Though the village of Qaryut has been coordinating with the District Coordination Office the military was nowhere to be seen. The settler began arguing with the farmers, ordering them to leave their own land. The argument escalated, the settler punched one of the farmers with one of his friends leaping to his defense and a struggle occurred, the third Palestinian man managing to call the DCO to alert the military, and take photos on his mobile phone. The men managed to subdue the settler and detain him briefly until the military arrived shortly thereafter. 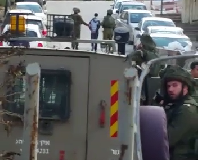 They ordered the farmer who came under attack to accompany them to the police station of the Bet El settlement. Upon arrival, the farmer was accused of initiating the attack and wielding the stick the settler had threatened him with. 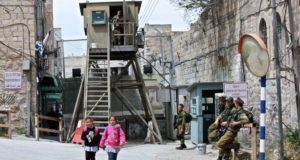 Now sustaining minor injuries and faced with the possibility of the settler pressing charges on the victim, the farmer was forced to drop the charges and find his own transportation home to Qaryut from Ramallah. The settler was released without retribution. This is the first incident of settler violence during the olive harvest this year in the village of Qaryut, closely located to the illegal settlements of Eli and Shilo.